Sixty-two percent of Americans think that the country should reduce spending in order to cut the deficit. What do they think we should cut? Nothing really. Well, nothing except foreign aid. Kevin Drum at Mother Jones reminds us that foreign aid is about one percent of the U.S. budget. …there were only four [other] areas that even a quarter of the population was willing to cut: mass transit, agriculture, housing, and the environment. At a rough guess, these areas account for about 3% of the federal budget. You could slash their budgets by a third and still barely make a dent in federal spending. The extremely low numbers for Social Security and Medicare are in a way even more interesting, so much for fearing socialism! There is a systematic problem with this poll. They've given 17 options for cutting spending without any information as to what fraction of the budget those options account for. A person taking the poll then picks 3 or 5 things that sound unimportant to them believing they've cut the budget drastically. Obviously, people from different demographics pick different things (republicans cut the environment, democrats cut defense, young people cut social security, old people cut education), so you end up with a fairly uniform distribution of cuts. The only thing this poll tells you is that foreign aid is incredibly unpopular. What would have been really interesting is to ask people taking the poll to estimate how much of the budget they believe they had cut. Or, at least, tell the poll takers the percentage of the budget of each item. I bet then you'd see cuts for defense and social security go up. I remember this from my high school economics class 20 years ago. It's good to see that the population isn't any more educated now than they were then...I guess. Ugh, "national defense" can be such a misnomer. It sounds so important, so no one wants to cut it of course. And defense is important. But invading countries that don't pose any realistic threat to us (Iraq) is not "defense"!! Where is "corporate welfare" on this list? I think there were posts on this a few months ago on Yglesias' blog or FiveThirtyEight. 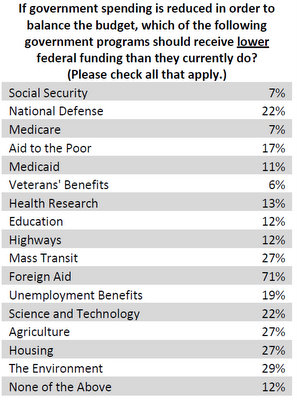 It's even more delicious when you dig deeper : not only do people want to cut nothing except for foreign aid, but they massively overestimate the percentage of the budget it represents... so when you ask them what percentage it should be cut down to, the answer is something like 3%. So not only is foreign aid the only thing they want to cut, they don't even want to cut that ! They want to increase it ! The only way you can make this statement is if there is complete overlap across all of those categories. Ie, the people who said Vet benefits also put EVERYTHING else; the people who put SS/Medicare also put EVERYTHING except that and Vet benefits; etc etc etc. Otherwise, it's trivially easy for every person in that 62% of people to have chosen at least a couple of these categories, even taking out foreign aid. What this shows is not that most of those 62% say we shouldn't cut any categories - it shows that the people who make up that 62% don't agree on what to cut.